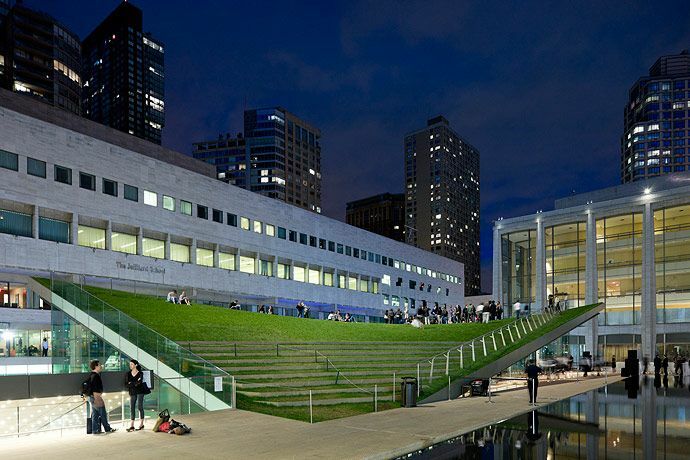 General Contractor: Leher McGovern Bovis, Inc.
One of the largest and best-known arts complexes in the world, the Lincoln Center for the Performing Arts encompasses 12 independent companies and 15 venues bringing a wide range of events to five million visitors per year. The Center has undertaken an ambitious modernization of its midcentury campus over the past decade. The overarching design challenge consisted of reactivating the connection between the 16-acre campus and its Manhattan neighborhood, increasing the visibility of resident organizations, and drawing in new audiences. The Lincoln Center is the home of the Metropolitan Opera, the New York City Ballet, the New York Philharmonic, and the Juilliard School. 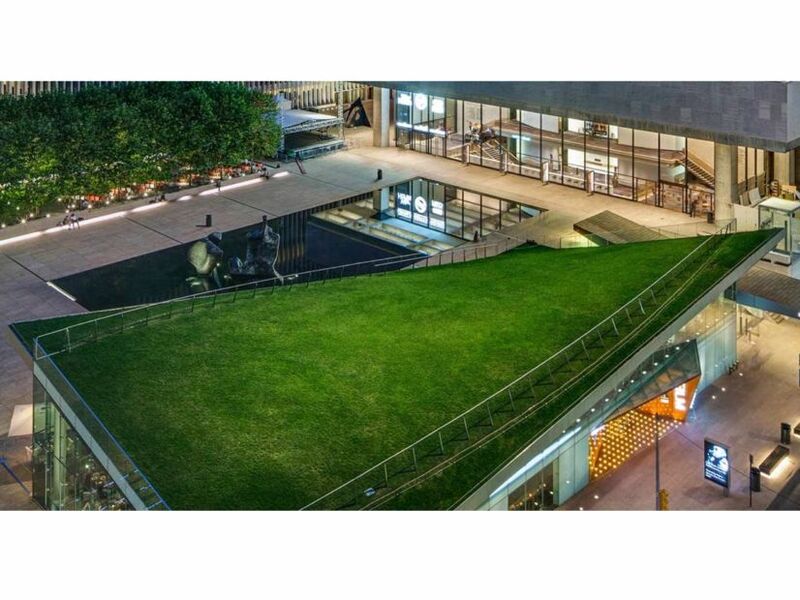 Part of Lincoln Center's $650 million West 65th St. redevelopment plan, the redesigned Lincoln Center for the Performing Arts has a free standing glass-walled restaurant topped with a 10,000 sf sloped vegetated roof that doubles as a campus lawn - The Hypar Pavilion, known as the Laurie M. Tisch Illumination Lawn or simply the Illumination Lawn. 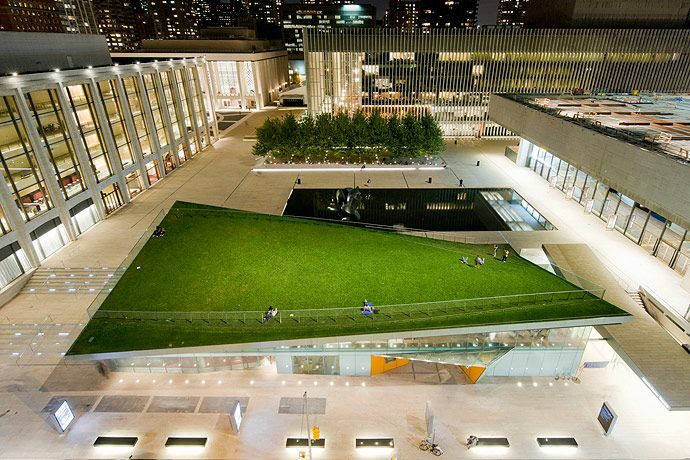 Shaped in the form of a hyperbolic paraboloid, architects Diller Scofidio + Renfro and FX Fowle Architects, in collaboration with a turf expert, Frank Rossi, and horticulturalist William Harder, first tested mock-ups of the greenroof lawn at 1/16 the size of the actual space. The roof reaches a full height of 11 feet from the plaza level and 23 feet from the sidewalk level and extends down to the plaza on the south end, providing access for pedestrians. Consisting of a blend of tall fescue and Kentucky Blue grasses, the greenroof measures 148' x 73'. At the base of the greenroof are a series of stepped stairs also covered in turf. Clear glass railing was installed along several edges of the lawn area. "The slope varies from a 1:12 pitch at the landing point to a 3:12 slope at the edges. About 50% of the roof is at a 2:12 slope, providing a fairly comfortable climb for visitors," (Barista, 2010). The Hypar Pavilion received the 2011 Design Award from the AIA New York Chapter and the 2011 Innovative Design in Engineering and Architecture with Structural Steel awards program (IDEAS2). Many improvements and amenities include a beautiful fountain located on the North Plaza which provides a welcoming approach from the Broadway entrance, and most importantly the highly visible turf covered greenroof that stretches over 65th Street. The grass roof is accessible from the plaza so people can bring up their lunches, eat, relax and look out over the lovely reflecting pool below. American Hydrotech, the greenroof provider, teamed with the design firms to meet the challenge of installing a greenroof of this imposing shape. During the conceptual stage, it was evident that the market's existing greenroof components and assemblies would not be adequate to handle the varying slopes of this roof or the anticipated accommodate the foot traffic. From this realization, a new steep slope product and assembly for this type of greenroof was developed, GardNet�, which provides the appropriate measures to cope with the shear forces and growing media retention. The product is "an expandable polyethylene sheet strip assembly, connected by a series of offset, full-depth, ultrasonic welded seams aligned perpendicular to longitudinal axis of strips which, when expanded, form walls of a flexible, 3-dimensional, cellular confinement system. Each section of GardNet� is 8 cells wide by a multiple of cells long," (American Hydrotech product data). It is mechanically secured to the upper portion of the roof. Copyright © 2012 台灣綠屋頂暨立體綠化協會. All rights reserved.